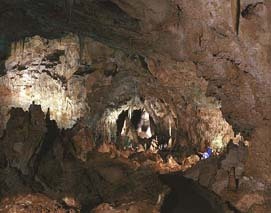 Caves form in rocks such as Limestone and Gypsum that are disolved by acidic waters traversing fracturesx in the rock. Through time the fractures are enlarged to form passages. The official definition of a cave is it must be large enough to be traversable by a person and at some point reach total darkness. 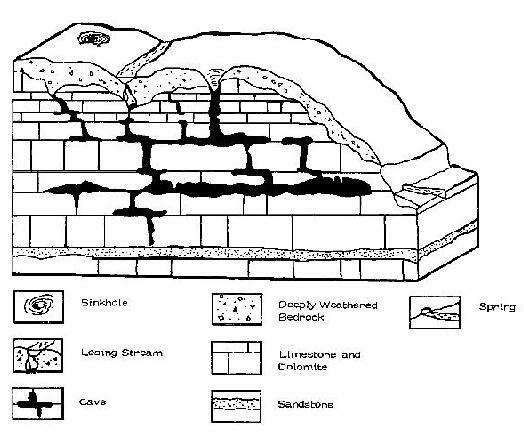 Illustration courtesty of Mammoth Cave Nat. Park We now know that caves can form under several hydrologic conditions. The most common way is by rain water collecting carbon dioxide to be weakly acidic, then entering fractures in Limestone. 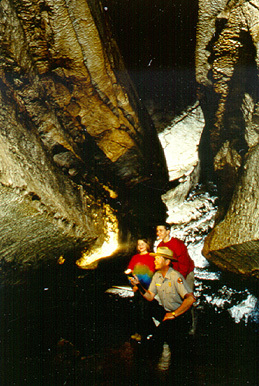 As the water flows with the hydrologic gradient it dissolves the rock and forms caves. Many of the well known cave systems, including the Mammoth / Flint Ridge System in Mammoth Caves National Park were formed in this way. A second mechanism for cave formation involves "mixing zones" where waters of two different chemistries mixes resulting in more chemically aggressive water and enhanced cave passage formation. Carlsbad Caverns is perhaps the best known example of this type of cave, formed when oxygenated surface waters mixed with H2S charged mineral waters ascending from the adjacent Delaware Basin. Another "mixing zone" environment occurs in oceanic islands. Fresh water from rainfall percolates down and meets the salt water from the ocean along a zone called the "halocline." Shallow, maze like "Flank Margin" caves form along this interface. Flank Margin caves have many features in common with other types of mixing zone caves including the presence of scallop-like indentations on the walls and ceilings of the passageways. Illust. From Mylroie, J. E, et al, 2001, Karst features of Guam in terms of a general model of carbonate island karst: Journal of Cave and Karst Studies, v. 63, no. 1, p. 9-22.